I made some exercises a while ago but keep re-using them for SPARQL tutorials and hands on sessions. I now moved them to a new webpage. This page presents SPARQL queries in increasing complexity that one can copy-paste into the interactive query field of the Dutch Ships and Sailors live triple store. Below you can also find the slides I used this tuesday for a workshop around Linked Data, Dutch Ships and Sailors and SPARQL, which form the introduction to the handson session. A while ago, we submitted a project description of our Digital History project Dutch Ships and Sailors to the DHCommons journal and this week the first issue of the journal was published containing our paper “The Dutch Ships and Sailors project“. This is a nice companion piece to the more technical description of the dataset which was published in the proceedings of ISWC 2014. The new version highlights more the general setup of the project and the considerations and innovations of the project from a historical point of view. Since submission of this ‘mid-term project description’, the DSS data cloud has been expanding, and the ‘development’ version of the triple store now hosts six datasets thanks to the work of Jeroen Entjes (see the datacloud figure). The Dutch maritime supremacy during the Dutch Golden Age has had a profound influence on the modern Netherlands and possibly other places around the globe. As such, much historic research has been done on the matter, facilitated by thorough documentation done by many ports of their shipping. As more and more of these documentations are digitized, new ways of exploring this data are created. This master project uses one such way. Based on the Dutch Ships and Sailors project digitized maritime datasets have been converted to RDF and published as Linked Data. Linked Data refers to structured data on the web that is published and interlinked according to a set of standards. This conversion was done based on requirements for this data, set up with historians from the Huygens ING Institute that provided the datasets. The datasets chosen were those of Archangel and Elbing, as these offer information of the Dutch Baltic trade, the cradle of the Dutch merchant navy that sailed the world during the Dutch Golden Age. Along with requirements for the data, the historians were also interviewed to gather research questions that combined datasets could help solve. The goal of this research was to see if additional datasets could be linked to the existing Dutch Ships and Sailors cloud and if such a conversion could help solve the research questions the historians were interested in. Data visualization showing shipping volume of different datasets. 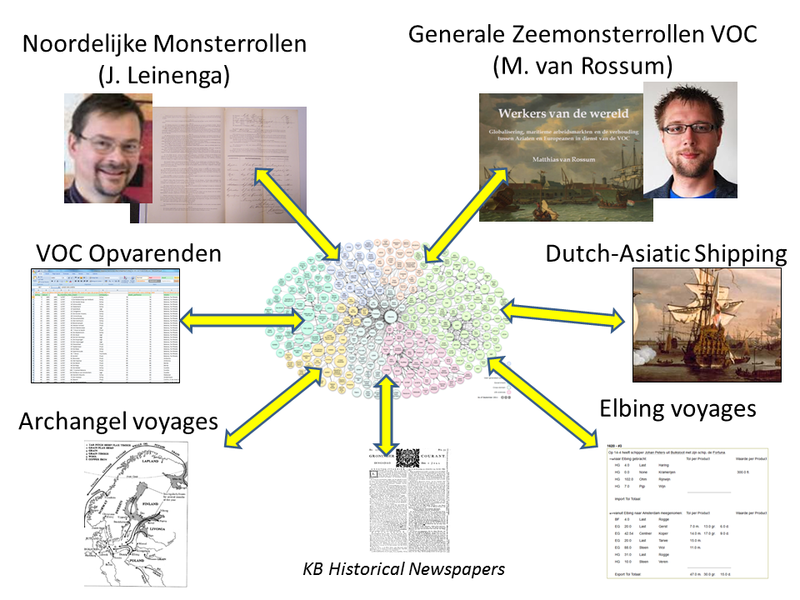 As part of this research, the datasets have been converted to RDF and published as Linked Data as an addition to the Dutch Ships and Sailors cloud and a set of interactive data visualizations have been made to answer the research questions by the historians. Based on the conversion, a set of recommendations are made on how to convert new datasets and add them to the Dutch Ships and Sailors cloud. All data representations and conversions have been evaluated by historians to assess the their effectiveness. In the same issue, there is an article about the workshop around newspaper data as provided by the National Library. This includes a picture of me presenting the DIVE project. You can read these articles and much more more in the june 2015 issue of E-Data and Research. And the backlog at www.edata.nl. data under Open Access (read more about this on OpenAccess.nl) . This data was the result of a very small research project. 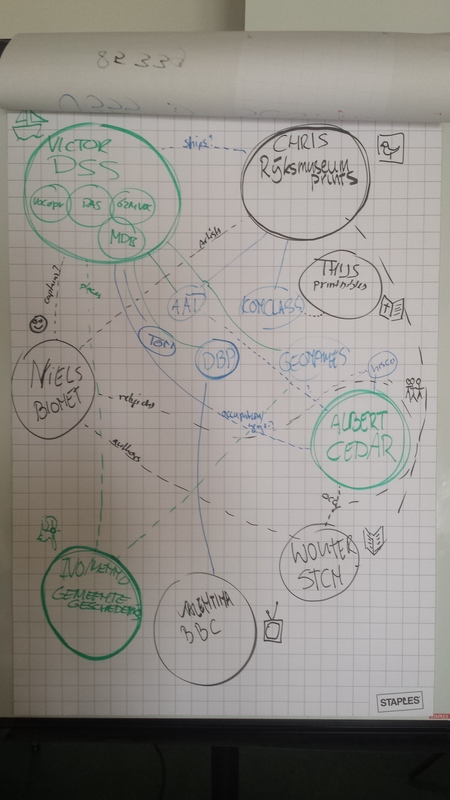 A bit belated, but on April 2nd, we organized a ‘datathon’: a one day event where we sat down with pizzas and laptops to link up multiple digital history datasets. The Dutch Ships and Sailors data was one of those datasets, other participants included Niels Ockeloen from the BiographyNet project, Albert Merono from the CEDAR project and Chris Dijkshoorn who brought Linked Data from the Naturalis and Rijksmuseum collections. External participants included Ivo Zandhuis from gemeentegeschiedenis.nl. 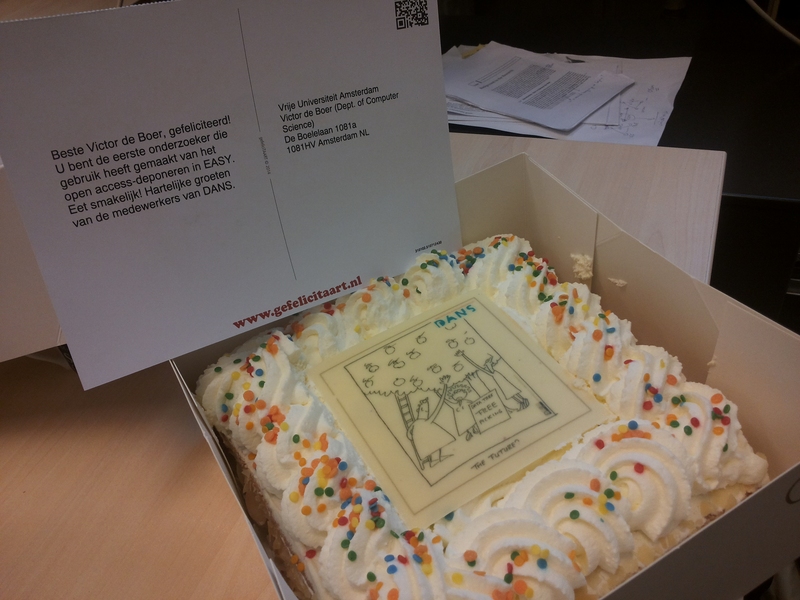 5000+ links from people in the BiographyNet RDF data to people in the Rijksmuseum RDF data.